WINN brings innovators together, and acts as a catalyst, supporting a community of inspirational individuals and dynamic businesses across Worcestershire. Our aim is to develop a reputation for innovation excellence, promoting Worcestershire as the premier location for investment in pioneering technologies. So, whether you want to connect, collaborate, or just be inspired- WINN should be your first point of call. Our belief is that great things happen when people get together. Our regular WINN events are ‘going on tour’ to meet innovative local businesses across the county of Worcestershire. Our five speakers are from diverse professional backgrounds and share their insights on the key challenges that face innovators. Innovation can sound elitist, but simply put; it just means doing something differently. An opportunity to be inspired, think differently, and gain practical tips to improve your business. Our speaker’s presentations focus on ‘Technology Readiness Levels’ (TRLs) a method used to determine the maturity of technological innovation. Topics include: mind-set, idea creation, prototype development and commercialisation. Perhaps this is just the springboard you need to start your own innovation journey! 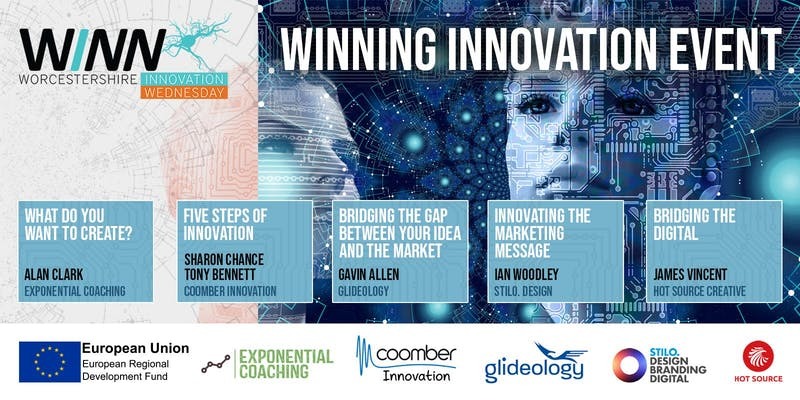 Our third WINNing Innovation event is hosted by Coomber Innovation. Coomber have 100years experience designing and building products and now offer a range of services to share their knowledge, experience, and skills with others. Their Innovation Hub bridges the gap between your initial idea and the final product. The event will include complimentary refreshments and a tour.